There's no getting away from Brexit! It took them quite a while, but the 27 heads of state of the European Union last night finally made Theresa May an offer she couldn't refuse. 29 March is no longer deadline day. There are now TWO departure dates! No matter how sick we may all be of the dithering Brits, of Mrs “maybe-I-will, maybe-I-won't” May, Boris “Bloody Hell, No” Johnson and the rest of the moping Jacob Rees-Mogg and other guffers and gasbags, they're not gone yet. The current situation is wonderfully summed up by the front-page headline in the French daily newspaper Libération: “Brexit won't be happening on 29 March,” we read, “it's going to be on 12 April, unless, of course, it's on 22 May”. In other words, the 27 remaining states last night magnanimously, and unanimously, agreed to the British prime minister's plea for more time. Theresa May has been given until May 22, provided she can finally get her parliamentary colleagues to vote in favour of measures they've already twice rejected. 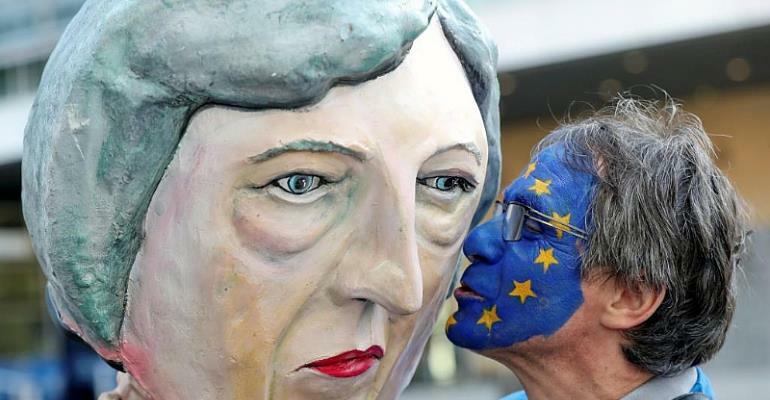 If they vote against, again, the United Kingdom will leave the European Union on 12 April, without a deal. What the Europeans have managed to do, finally, is engineer a situation in which the United Kingdom will not be able to blame Europe for a no-deal departure. A sceptic might say that their political system has already been given two-and-a-half years to come up with a clear answer before 29 March, and they couldn't manage that. Giving them two departure dates and a shorter deadline might be the solution. But then again, it might not. Well, the waiting is nearly over. The fog is about to lift. We're on the brink of Brexit! The headline in French conservative paper Le Figaro says the Brits have been beaten at their own game! “London falls into Europe's remarkable trap,” is how Le Figaro sees last night's outcome. The spring in the trap is the European parliamentary elections. Since everyone thinks the House of Commons will next week once again reject the proposals they have already rejected twice, 12 April is the date on which the London government has to vote in favour of the decree to enable the United Kingdom to participate in the European poll. Which is pretty clever, since the various Brexit factions across channel will never support a move to take part in elections for seats in a parliament they want to leave. If there's no UK participation in the elections, they'll be out with no further grounds for hesitation, on 22 May, the day before polling stations open across the European Union. Bingo, the Brits are backed into a corner. We'll probably come to miss them. Eventually. But we've kept the best till last. There is a parliamentary rule in London which says that Westminster has to consider organising a debate on any subject, provided at least 100,000 registered voters call for it. Well, the online petition calling for an end to Brexit collected more than one million signatures in a single day yesterday. The website of the House of Commons actually blew a fuse because it couldn't handle the traffic reckoned at 1,500 signatures every minute. It's been patched up and is once again accepting entries. Sanity may not be as widespread as Hugh hopes. Let us remind him that, on 23 June 2016, 17 million of Her Majesty's subjects voted in favour of David Cameron's proposal to leave the European Union. They beat the sane ones hands down, by one million votes. Possibly the same million who've just voted alongside Hugh Grant. We'll probably come to miss them all. Eventually.